I’m afraid this is going to be a very brief post, as I’ve been sick since the weekend. However I couldn’t let the final episode of the Great Australian Bake Off (which airs tonight) go past without at least providing an update on my quest to bake each weekly technical challenge. Week 6 of The Great Australian Bake Off (GABO) saw the bakers attempting a Layered Pavlova Torte with Fondant Strawberry decorations. Now I had every intention of making the decorations as I enjoy making models and decorations out of fondant. However, after waking up sick on Saturday, by the time I had finished baking the meringue I have to admit I just didn’t feel well enough to make them and I went back to bed instead. I will give them a go when I am feeling better and will update the post with them. If you are familiar with cooking pavlovas/meringues then this recipe is quite simple. I really liked the addition of the toasted almond meal to the meringue, it helped cut through the inherent sweetness of a meringue and also provided a nice depth of flavour. The simple filling of whipped cream, strawberries and passionfruit was lovely and balanced well with the crisp/chewy meringue. I did pipe my layers a bit thinner than I should have, however I was still happy with the final result. If I was going to make this again, I’d use the leftover egg yolks to make some lemon/passionfruit curd to ripple through the cream filling. I’d also make smaller individual ones if I was entertaining, as it is quite messy once you cut into it! Two more challenges to go. Next up, Breakfast Croissants. But for now, it is time for a nap to try and get over this virus before setting myself up on the couch later with a cup of tea later for the GABO final! Week 5 of The Great Australian Bake Off (GABO) was bread week, and the technical challenge saw the bakers making Coffee Scrolls. Now I have to admit, I am not a coffee person. I absolutely love the smell of coffee, but I just can’t bring myself to like the flavour of it. I don’t drink it and I don’t like it in desserts. 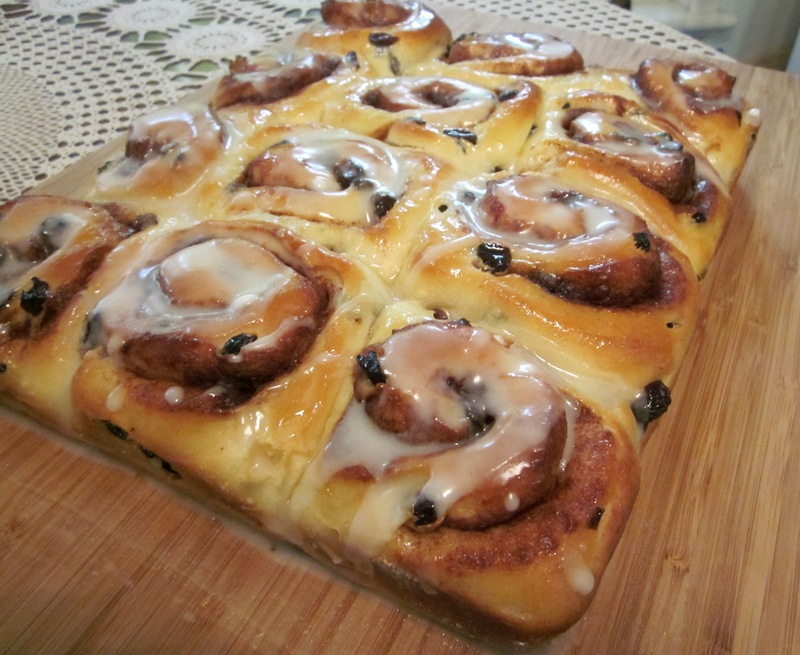 However, I really like cinnamon scrolls, which is what these really are if you take the coffee out of the icing. So although I am supposed to be replicating the technical challenges, the reality is that I am cooking at home and I am the one who will be trying the finished product, so I decided to omit the coffee. Isn’t that part of the point of cooking/baking things yourself? You can make them the way that you like them. With the omission of the coffee, these have to be my favourite of all the technical challenges so far. Although a little time consuming with the resting time (which really lets you go off and do other things which is why the weekend is perfect for baking), I found this recipe quite easy. Plus the house smelt amazing while they were cooking and the finished product was delicious. I was actually jumping up and down when these came out and I tore them apart and saw the texture of the bread. I got impatient and didn’t wait for them to cool down enough before I iced them, hence my already thin icing got even thinner, but I didn’t mind. Any more icing and I think they would have been too sweet. I have to confess that I may have eaten a few too many scrolls over the weekend. I’d better get myself to the gym tomorrow! 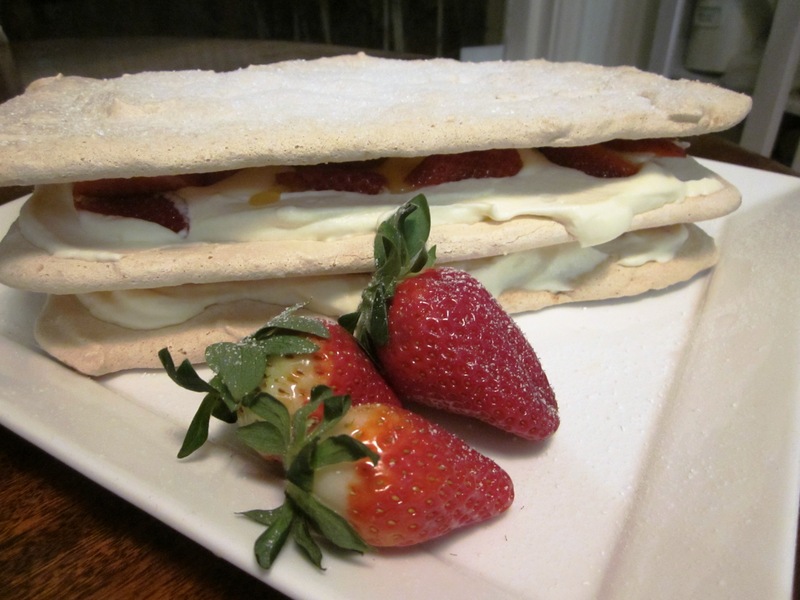 Next up, Layered Pavlova Torte with fondant strawberries. As I posted last weekend, for some silly reason I decided to try to recreate the Week 3 (Brandy Snaps) and Week 4 (Quiche) GABO technical challenges at the same time. As I’ve said previously, all was going well until I started to get a migraine. Normally when I make quiche, I use a shortcrust pastry, so I was intrigued with the idea of using rough puff pastry instead. Quiche is a great portable meal, perfect for work lunches or picnics, and great for using up leftovers from the fridge. You don’t have to stick to the fillings in this recipe. 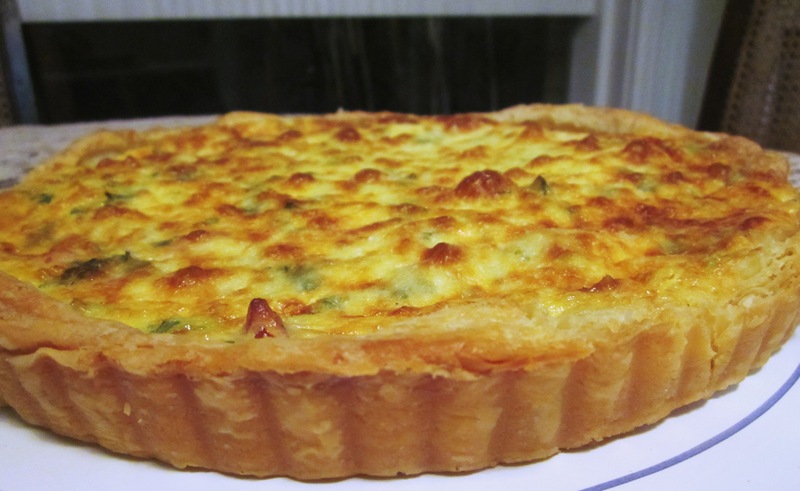 I used to make a cheat’s all in one quiche, without making the pastry (you just add pastry mix in with the filling, and it forms a base – I will post it in the future), but in more recent times I have always made it with the short crust pastry, as previously posted here. The rough puff pastry worked quite well and was a nice change to the shortcrust, but required a lot more effort and I think is more at risk of the dreaded “soggy bottom”. You do have to make it by hand though. This isn’t a pastry you can make in the food processor. I also found mine needed a bit longer cooking time, as the very centre of the pastry was not quite cooked enough. I had planned to take step by step photos of the pastry making process and folding, unfortunately when I went to use my camera its battery was flat, so there is only the finished photo. Sorry, I’ll try again next time. On the whole, the fact that I managed to finish a reasonable quiche while fighting a migraine (and without burning or cutting myself) I think was an achievement, although the edges of the pastry were a bit rustic. It still tasted nice and provided a great lunch/dinner on the run before rehearsals. However, I don’t plan on making it with this pastry again if I’m making a large sized quiche. I might try it with canapé sized ones next time though. Next technical challenge? Coffee scrolls. 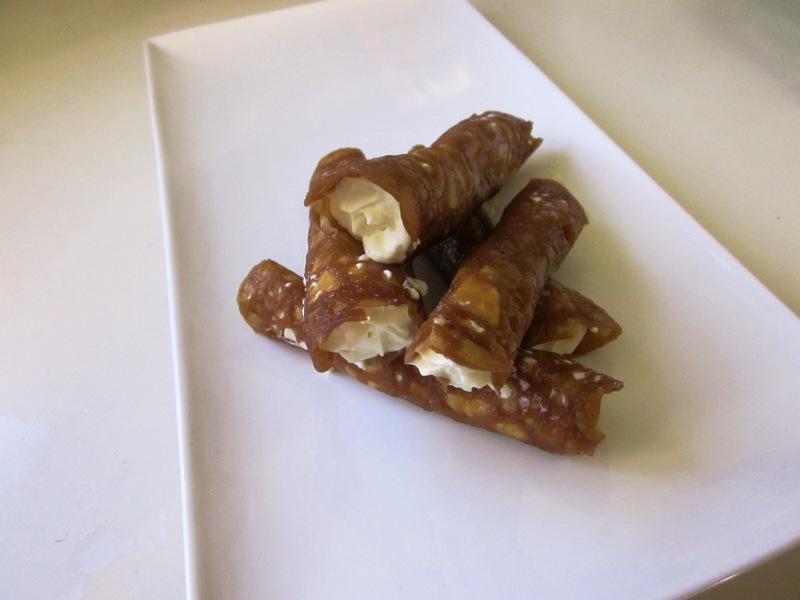 First attempt at brandy snaps – more practice needed! After a very busy week, for some reason I thought it would be a good idea to try to recreate the Week 3 (Brandy Snaps) and Week 4 (Quiche) GABO technical challenges at the same time. All was actually going well until I started getting a migraine. I had originally intended to keep making the brandy snaps until I had perfected them, just like the contestants in Week 3 who made multiple batches in their quest to create 12 perfect brandy snaps. Unfortunately with the onset of a migraine, I had to throw in the towel after just one batch and admit defeat – for now. I managed about 6 salvageable brandy snaps from my first batch (although they weren’t the best and looked nothing like the ones in the picture from the original recipe), only to then break one when I was filling it with the cream. However, given how I was feeling at the time, I think the fact that I made any of them is an achievement. I will have to try again when I have more time and am feeling 100%! I also found that my wooden spoon handles were a bit too narrow to get the best cylinder shape. I’ll have to go hunting for a bigger one before I try these again. Also, although the recipe recommended cooking four at a time, until you have got the hang of making these I would recommend only cooking 2 – 3 at a time. It will take longer, but you will end up throwing away less, so you will save time in the long run. The brandy snaps are very sweet on their own, although the addition of the cream helps to balance this, with nice caramel and ginger flavours. Next time I will also try making some as little cups like I’ve seen before. Next up, a couple of savoury recipes after a few weeks of only sweet, including the Week 4 Quiche challenge.